On this date in 1959, a disturbed Japanese serial killer was hanged for eight murders. A past generation’s emblem of monstrousness, Genzo Kurita (English Wikipedia page | Japanese) was invoked on the floor of the Diet as a reason to keep the death penalty. He got a separate death sentence for those murders (plus two other earlier ones) later in 1952. 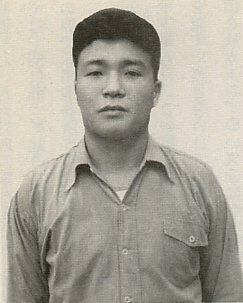 A touch unstable — obviously — Kurita withdrew his own appeals in 1954 to get it over with, but it still took the ponderous Japanese death penalty system the best part of the decade to see him to the gallows. Most of what’s online about Genzo Kurita is in Japanese, like this more detailed survey of his life in crime. * The raped mother, and three children; one of the children survived. The Osen Korogashi (or Osenkorogashi) cliffs, as it happens, have their own eerily topical legend of the generous daughter of a cruel lord being thrown over the precipice in her father’s place, prompting him to see the error of his ways.